Delicious to eat, the rockfish in Washington’s Puget Sound were being fished to levels that threatened extinction. 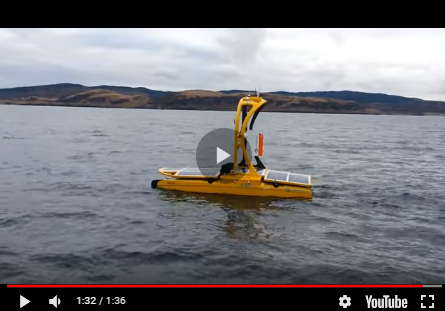 Now, scientists at the Washington Department of Fish and Wildlife are undertaking an important conservation study into the threatened rockfish species using a Saab Seaeye Falcon underwater robotic vehicle. Senior Marine Fish Research Scientist, Dr Dayv Lowry, explains that managing the conservation and recovery of rockfish populations in Washington’s Puget Sound depends on the accurate monitoring of rockfish populations, depleted through overfishing and ecological degradation. “Of the tools we’ve tested, only the Falcon can find and measure the rockfish and other structure-associated marine fish species found amongst the deep and rocky seabed,” said Dr Lowry. “The Falcon’s versatility and robustness have allowed us to deploy various camera and instrument payloads while maintaining manoeuvrability and speed, which are critical to exploring complex habitat in an efficient manner. Without this system, we simply could not manage natural resources with the degree of scientific rigour we currently employ." Added to the vehicle’s precise manoeuvrability amongst the cracks and crevasses of complex underwater rock formations, the Falcon, whilst small in size, “has enough bulk and power not to be pushed around by the current,” added Dr Lowry. Until the deployment of the Falcon, population studies were imprecise as trawl surveys were better suited to sampling mud than the rockfish’s rocky habitat, and many rockfish occur too deep for scuba divers. At just a metre long, the Falcon was deployed from a small research vessel and can operate at depths up to 1,000 feet and in all seafloor habitats. Its video data is used to produce precise population estimates for the most commonly encountered species and allows the department’s scientists to describe and quantify the relationships between fish and their preferred habitats. Video data also reveals derelict fishing gear, ready for removal from Puget Sound waters. Equipment fitted to the Falcon included a high-definition camera to detect and identify many of the small and cryptic fish, along with a stereo camera for assessing both individual fish size and the density of fish in a measured field of view. A conductivity-temperature-depth metre is included to collect data in real-time that will be used to examine linkages between physiochemical water quality parameters and fish distribution/abundance. The Falcon’s concept comes from packing five powerful thrusters and an intelligent distributed control system into a small, easily manhandled 1 x 0.5 x 0.6 metre-sized vehicle that can adopt different tools and sensors for undertaking numerous intricate and demanding tasks. Rated 300m and 1000m, the Falcon’s power and control make it highly manoeuvrable and able to master strong crosscurrents whilst undertaking exacting tasks with steadiness and precision.